My name is Marco Geurtsen, and I am an Electrical Engineer in the Advanced Control Team. 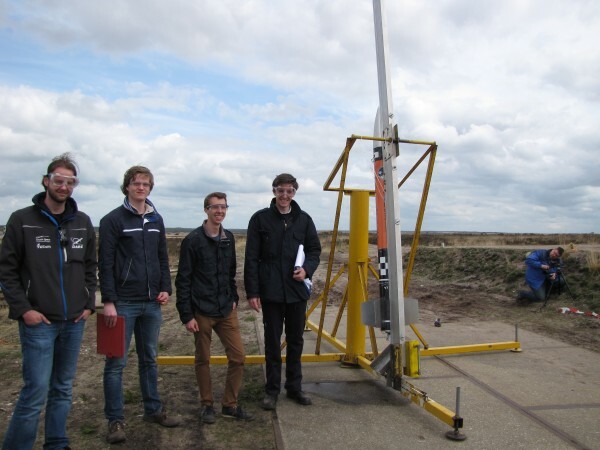 On Friday the 1st of May, the Advanced Control Team successfully launched a CanSat Launcher V7, to gain flight data which will be used to tune the control algorithms of DARE’s first actively stabilized rocket, the V7S. The CanSat Launcher V7 is a standard rocket of DARE, used to deploy small satellites made by high school students for the CanSat event. The CSLv7 is capable of carrying 4 soda can sized satellites in its payload pay. The Advanced Control Team developed a modified version of this rocket (the CanSat Launcher V7S) in September 2013, which is able to actively stabilize its flight path with four canards mounted below the nose-cone. The V7S-T is capable of reaching higher altitudes because of active stabilization. In August 2014 the ACT successfully performed a wind tunnel test at the Aerodynamics Lab of the TU Delft, to test the dynamic flight behavior of the V7S. For the flight test in May 2015, a standard CanSat V7 is equipped with the flight computer of the V7S, which contains various sensors such as gyroscopes, accelerometers, and a pressure sensor. The sensor data is saved during flight on an SD card in a black box, which could be read out after the landing. This data is used to optimize the control algorithms of the flight computer of the V7S, which will be launched soon. I believe that the launch day of May 2015 was a great success for the ACT. First of all, the calm and sunny environment made it perfectly suitable for a launch. My team had a structured organization during the launch day, which resulted that the launching procedures were executed smoothly and efficiently. The launch went flawless, and the parachute opened without troubles which resulted in a soft landing without hardly any structural damage to the rocket. Because of this the SD card was still intact, hence I could retrieve all flight data. Unfortunately the night before the launch I had to make last-minute fixes to the electronics, because some of the sensors did not meet the pre-launch-check requirements. The data logging system was unstable. For some reason the data logging program crashed after 10 minutes, which probably was caused by a sensor on the I2C bus that crashed because of the high sample rate. Since data acquisition was absolutely crucial for this flight, small system failures were not accepted by the team, hence these errors needed to be fixed at all costs. This meant that I had to find the crashing sensor without decent equipment during the night. Eventually I enabled a few clock dividers and got the logging stable for an hour. I sacrificed some sample rate but the launch day went great, so my hard work without sleep paid off. Although the launch itself was a 100% success, it did not go without a certain amount of stress. You have to imagine this: the data recording system will be activated in the rocket assembling tent, already 30 minutes prior to launch. Once it is activated, it starts beeping every second to let the team know that data is being saved. You can see this beeping as the heartbeat of the rocket. If it beeps, it means the rocket is alive and saves data. If it makes a non-stop continuous sound, the rocket is dead and the data recording system failed, which means an aborted launch. So for at least 30 minutes you are praying that the beeping does not stop. Once you walk safely away from the launch tower, you cannot hear the beeping any more so you don’t know whether the system failed or not. Luckily the rocket still beeped once the military recovered the rocket from the landing site, so I was relieved that my work during the night was successful. On the 1st of May the Advanced Control Team showed that although they were under a lot of pressure due to last moment sensor errors, they will do everything to get the job done, and that they will not stop working until results are satisfactory. This day was a big step forward for the ACT, however they have to make another jump to achieve the final objective of the project: launching DARE’s first actively stabilized rocket. Find out more about the Advanced Control Team Here.